Ollie Greenwood is to be released from the Peterborough Panthers speedway team. Peterborough Panthers will release struggling reserve Ollie Greenwood later this week. The 20 year-old has failed to fire in the opening half of the 2015 season and departs by mutual consent to seek a fresh start elsewhere. 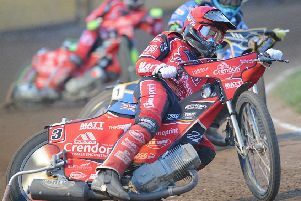 Greenwood, who won the British Under 19 title last season, will make a farewell appearance for Panthers in their big Sky Sports showdown against Glasgow on Wednesday (June 24). Panthers promoter Ged Rathbone said: “We have arrived at a mutual decision that Ollie will be released from the Peterborough line-up. “I can assure everyone that we part on very good terms as we all feel this is the right thing to do. “We have understandably been concerned about Ollie’s form for some time and have worked with him in an attempt to find some improvement. “Ollie has done his utmost to try to turn his performances around, but it just hasn’t happened and he does not want to be in a position where he could cost the team results. Panthers bosses are closing in on a replacement for Greenwood. The new man is expected to arrive in time to face Plymouth at the East of England Showground on Sunday (June 28).